What follows is a list of some of my favorite EDC knives, and knives that I recommend if you aren’t sure where to start. I have broken this down by approximate price point. This isn’t a perfect list, and I consider it a work in progress. That said, if you are new to the site and new to knives, these are what I think are among the very best EDC knives that I have reviewed. These choices vary in size and price, so some may be too big or too small to fit your budget or style of EDC, but I think most will agree that there isn’t a bad knife in on this page. These are all great knives and I’d be happy to have any one of them in my pocket. If you want to cut to the front of the line and learn exactly what I think the very best EDC knife is, then I have 3 recommendations for you: the Spyderco Paramilitary 2, the Spyderco Native 5 Lightweight, and the Spyderco Dragonfly 2. Some people may ask, why pick out 3 Spyderco knives? Well, if you read on in the article I’ll cover a number of different brands and options for you at each price point, but if you are looking for knives that are consistently good, then it’s hard to beat a Spyderco. And these 3 knives are some of the most used in my collection and among my favorite Spyderco knives. I keep coming back to them, even after owning them for years and years, and after reviewing knives that cost hundreds of dollars. These are simply great knives. I could list other knives, and I do further down in the article, but if you are simply looking for excellence you don’t need to look any further. You can’t go wrong with any of these 3. Frankly, for most people who are using their EDC knife to open mail, break down boxes, and do a little food preparation, the Dragonfly 2 is going to be plenty of knife. Sure it’s small, but in the hand it feels like a full size knife, it carries extremely well in the pocket, and it’s completely unassuming if you decide to use it in public. No one is going to freak out if you pull your Dragonfly 2 out in the office. The blade steel is VG-10, which is only considered an “OK” steel by today’s standards, but frankly it gets the job done and can take a scary sharp edge. I like the lightweight plastic handled version of the Native 5, because it’s lightweight and easy to carry. 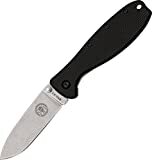 But if you want something stouter, then the Native 5 with G-10 handles and steel liners is a good choice. If you want something dressier then they make a sweet dress version in fluted Carbon Fiber and S90V steel. The Native 5 hits all the bases, and with it’s 3″ blade it’s still appropriate to use in most places. This knife is made in the USA and the base model comes in high quality S35VN blade steel. If you are looking for a bigger, heartier knife than the small Dragonfly 2 and the Native 5, then the Paramilitary 2 is a great option. It’s significantly larger than the other two knives, but it’s stout and often considered a “knife guy’s knife”. It’s not the best choice for urban environments due to its size, but if you don’t mind a bigger and heavier option then the Para 2 is tough to beat. While I have developed a great appreciation for all kinds of pocket knives, the Dragonfly 2, Native 5, and Paramilitary 2 all rank among my top picks and would be “go to” recommendations for pretty much anyone looking for a solid pocket knife. It has a funny name, and may not be the prettiest knife, but it’s a solid design and is supremely functional. It’s a great size for daily carry as well and retails for well under $35. They managed to pack in a lot of nice details for the price point. The blade shape is versatile, and the thin full flat grind makes it an excellent slicer. The blade steel is AUS-8. Not the hardest steel, so edge will dull faster than a more expensive blade steel, but I still get plenty of work done in between sharpenings. And when it’s time to sharpen the knife is very easy to maintain. The stainless steel frame lock is sturdy and secure. The ergonomics are also excellent. It is one of my top picks of all time. OK, with my reader’s digest “top picks” out of the way, I’ll now take a deeper dive into the best EDC knives based on price point. I’ll then offer some general tips for picking out the perfect daily carry blade. This section is for the best EDC knives under $50. In fact, most of these picks are under $30. This is a crowded segment with a lot to choose from. Companies churn out budget blades because lots of people buy them. What follows are the knives that keep finding their way into my pocket after years of use (and years of buying and reviewing knives). My top pick in the $40 range is still in the ESEE Zancudo. Tough to beat that knife for the money. Other good options for an inexpensive folder include the Rat II, the Kershaw Skyline, the CRKT Drifter, and the Cold Steel Pro Lite. Or a good Swiss Army Knife like the Alox Cadet. Here’s an interesting choice for a sub $40 folder: the CRKT Swindle. Super cool design. It’s a take on the classic Swayback pattern. The thin blade is versatile and a great for EDC tasks. Snappy action with a dialed in flipper on IKBS bearings, paired with a sturdy framelock. The pocket clip is interesting. Not my favorite, but it works. For a fixed blade EDC, the CRKT Folts Minimalist is my top pick. This section is for that tough $50-$100 price point. It seems like manufacturers focus on the high end of the market, and the low end of the market, while the middle market gets ignored. That is a shame because some of my all time favorite EDC pieces can be found in the $50-100 segment. Most notably, the Griptilian and Mini Griptilian, the American Lawman, and the Spyderco Dragonfly II. At this price point you get good steel, time tested designs, and a value proposition that is tough to beat if you are looking for a solid tool knife. You have a lot of great options in this segment. Classics like the Kershaw Blur and Spyderco Native 5. Plenty of good options from Cold Steel like the American Lawman, Recon 1, and Code 4. Boker makes some interesting offerings in this price range like the Urban Trapper. Lots to like here. Here is an interesting contender for “Best EDC Knife” for around $100 – the Boker Plus Urban Trapper. This knife is super light and super thin. Just an elegant gentleman’s folder take on the EDC knife. Under 2 ounces. Titanium framelock flipper with bearings. Full flat grind with a satin finished flat grind. It’s downfall is that this is a super light duty knife. You can’t put too much stress on the thin framelock. But if you are OK with light duty, this is a really cool piece. On the opposite end of the spectrum, the Cold Steel American Lawman is a super tough work knife. You can see mine has some wear on it. That’s because I’ve owned it for 5 years. It still gets carry time. It’s a salt of the earth type knife, and one of Cold Steel’s less aggressive offerings. Mine is the old version in AUS-8 Steel. Cold Steel has since switched to S35VN. The handle is super comfortable, and the 50/50 choil provides versatility. I draw an arbitrary line at $100+ for high end EDC knives. At that price range you begin to get into more premium blade steels and handle materials, and you see true separation from knives under $100. Most notably, at about $120 you get into Spyderco Paramilitary 2 and Native territory – 2 of my all time favorite EDC knives. There are a lot of classic knives that fall into this category, so how about a relative newcomer? The Benchmade Bugout was released a couple years ago and has quickly developed a cult life following. When you get one of these into your hands it becomes easy to see why. The blade is thin and very “slicey”. The handles are thin and light, yet provide a nice tactile feel in the hand. The overall knife feels wonderfully dialed in. Nice, glassy smooth action, tight lockup, and bright blue anodized accents make this one “pop”. Some may grouse at the price tag, but at ~$120 I think you are getting a great USA made knife. Here is yet another great option from Spyderco. Torn between the Para 2 and the Native 5? Enter the Sage 5. Clad in carbon fiber / G-10 handles, this is another thin, light, high performance knife. It blends the looks of the original Sage 1 with the fun and function of a compression lock. It comes with a fully flat ground CPM-S30V stainless steel blade. It’s a little more robust then something like an Urban Trapper or Benchmade Bugout, but it also weighs a little more. Still, it’s well under 3.5 ounces, and I think it’s another great choice if you are looking for a good all-round folding knife with a touch of class. Here’s another dark horse for best EDC for around $100. The Buck Marksman is kind of an odd knife at first glance, but if you manage to pick one of these up, it’s actually a great knife. Solidly made and with an amazing springy action that feels like an assisted opening knife thanks to the special Grant and Gavin Hawk Strap Lock. The 154CM blade is excellent. Holds a great edge, and the thin hollow grind makes it a powerhouse of a cutter. Much like the American Lawman, this is a work knife. It will take a beating and cuts extremely well. Plus, it’s made in the USA. I put “Ultra” in quotes because this category starts at $200 plus, and it’s very easy for some folks to collect and “carry” $2,000 custom knives. So there is definitely many levels of knife collecting above this list. But I think for most people a $200-400 pocketknife will be considered a ultra high end carry. Plus I need some way to organize this page so this is the “ultra” section for now. What I like about this section is you can dabble in high end ZTs, Spydercos, and Benchmades, but also get into brands like Chris Reeve and Strider. There are collectors that specialize in custom knives. Knives that routinely sell for several thousand dollars. I really focus on production knives, with the vast majority of them being under $250. That said, I occasionally fall off the deep end and review $500+ knives. Most notably the Hinderer XM series and the Shirogorov 95T. I do not own any custom EDC knives. These uber expensive production knives are cool, but I don’t really recommend them for EDC for most people. I find the 3.5″ Hinderer to be bulky. The 3″ version is cool, but expensive. The Shirogorov is a work of art. Just a beautiful knife. Some guys really enjoy carrying them. Personally, I get antsy any time a knife that expensive enters my pocket. For those wanting reviews of higher end stuff, I have created entire page dedicated to high end pocket knives. I’ve reviewed a lot of them over the years. There are a lot of articles out there on the subject of the best EDC knives. Some are better than others, but it’s not a bad idea to compare notes and see what sort of trends develop. But why read this article and listen to my particular advice? I’ve been reviewing pocket knives on this website since 2011. In that space of time I have reviewed somewhere between 200-300 knives, and the list grows every year. I own everything I review, and I keep a lot of the knives. Not all of them, but usually the best ones. The ones I like the most, or want to have as reference blades for future reviews. Consequently I own a least a hundred knives, and many multiples of that have been through my hands. I love pocket knives and have dedicated an unhealthy number of hours towards this website, and EDC knives in general. Another note, is that all the photography is my own photography of my own knives. You will notice a lot of stock photography on these “Best of” posts, because many of those articles were written by people that didn’t actually handle any of the knives! Crazy, but it’s probably true. That’s because these kinds of articles can get a lot of eyeballs from readers. EDC or Every Day Carry stands for the items you carry with you every day. If you are new to the concept to EDC then welcome to a whole new world of personal utility. There are a lot of interesting items that people carry with them every day, and I’ll briefly touch on them here. Of course, being BladeReviews.com I’m most excited about EDC knives and I have a large selection of daily carry knife reviews for you to consider. I realize it’s an older video, but frankly, my EDC hasn’t changed much. The phone has been updated, my flashlight is much smaller, but I still carry a wallet, flashlight, handkerchief, and occasionally a multi-tool. I also wear a watch as my sole source of jewelry and for timekeeping. We have run an irregular series of EDC updates showcasing our daily carries they have evolved over the years. Of course lets not forget the knife, the focus of this article. My daily EDC knife varied depending on the day, what I need to get done, my mood, and whether I’m testing out a review knife. What do You Use EDC Knives For? Some people may wonder why you would even need to carry a knife with you. After all, it’s 2018 and we live in a world of convenience. Easy open packaging, single serve, instant gratification. Plus knives are scary, and we don’t want to alarm our friends, neighbors and coworkers with a scary pocket knife. To the contrary, knives are highly useful tools. Sometimes you don’t realize how important they are until your EDC knife is no longer handy. At that point, you have to ask your friend. No one wants to be in that position. I mostly use my EDC knives for opening mail, cutting fruit and other light “food prep” type tasks, and opening up boxes containing other knives. Jokes aside, I do use my knife for breaking down cardboard boxes, and general utility tasks. They are handy for car repairs, home improvement projects, and first aid. They are especially useful for camping trips. And if you have a physical job like a carpenter, police officer, mechanic, or farmer, you will find a pocket knife to almost be essential. There are so many small cutting tasks where it makes sense to have a knife. Don’t use an EDC knife, for pulling, prying, using as a screw driver, a bottle opener, or wire cutters. It’s a cutting tool. Be smart with it and use it like a knife. If you need a tool with multiple functions consider a good Multi-Tool or Swiss Army Knife. As someone who has carried hundreds of different pocket knives, my goal is to help you find the ideal EDC knife for yourself – without having to own hundreds of pocket knives like I have (although it has been fun). If you want to cut to the chase, here are some of my tips for selecting the most appropriate EDC. This may sound obvious, but size matters when selecting an EDC. The knives I have listed on this webpage have blades that range from 2″ to just under 4″. This begs the question – what is the best size for EDC? Some countries, states and municipalities pick the appropriate size for you, and have restrictions on blade length for a pocket knife. If that’s the case, then your options may be limited. For most people, they will want an EDC knife in the 3″ range. Personally, it depends on what I’m doing. If I am working at the office, I’ll want a smaller knife (like the Alox Cadet or Spyderco Dragonfly 2). If I am working in the yard or helping a friend move, then I’ll spring for something larger like a Benchmade Griptilian or Spyderco Paramilitary 2. You will want to consider the tasks you will be using the knife for, as well as social considerations. It probably isn’t a smart idea to bust out a Strider SnG if you work at a call center, but it might be an OK choice if you are a diesel mechanic – common sense will dictate, and some people will actually carry 2 knives (a small one and a larger one) so they have the option depending on what’s going on. You also want to consider the weight of the knife. Sometimes that’s just as important as the overall dimensions. For me, super heavy knives tend to stay at home. I like lightweight and compact designs that give me plenty of utility without pulling my pants down. Of course plenty of people will say that steel matters in picking out a pocket knife. It does. To me, it doesn’t matter as much as I can easily and regularly sharpen my pocketknives. If this is a concern for you, check out the Spyderco Sharpmaker. It will turn just about anyone into a competent sharpener. That said, I know some people will have an absolute desire for the “best” steel. Often people consider the “best” steel to be the one that holds its edge the longest. I prefer a steel that holds a good edge but is relatively easy to sharpen. If you are new to steel I have devoted an entire section of the website to the subject. It should provide you with a decent primer on knife steel. Perhaps more important that blade steel, blade shape will dictate how you use a knife and how you maintain it. I like a simple non-threatening looking blade for EDC. These shapes tend to function well and won’t alarm people. I prefer a blade shape without recurves and serrations for ease of sharpening. I like a thinly ground blade that slices efficiently. I like a blade with a clean stonewashed or satin finish for aesthetics and ease of maintenance. Blade shape is important to consider. The handle directly impacts your use of a knife. A poor handle design will make for an unpleasant cutting experience. I like simple handles without a ton of jimping (serrations) and texture. A little grip is fine, but I don’t need my knife handle to resemble a cheese grater. I also don’t like handles with tons of finger grooves. Each hand is different, and it’s impossible for a knife designer to design a production knife that “fits” most people if it has very pronounced finger grooves. I generally like the handle to be relatively thin so it rides in the pocket well. I prefer handle materials like carbon fiber and G10, although fiberglass reinforced plastic has its place. I also like a well constructed handle. When I review a knife I can tell a lot about its quality by examining the handle. I look to see how all of the pieces fit together, whether they have been all properly finished, whether there are any sharp edges. I look at the hardware used to hold the knife together. I look for functional details like milled out liners and I look for artistic details as well. You can tell a lot about a knife by how its handle is made. Another hugely important consideration for selecting an EDC knife is how it carries in the pocket. A primary consideration is how you are going to carry the knife. Specifically: are you going to use a pocket clip? I could write an entire article on pocket clips, but I doubt many people would derive much value from it because it is such a personal decision. Tip up, tip down, right side, left side, deep carry, ultra deep carry – everyone has their preferences. Personally, when evaluating a pocket clip I look for slim and discreet pocket clips. I don’t mind a deep or ultra deep carry clip. Sometimes I prefer a clip that rides a little higher in the pocket for a work knife I will be drawing from my pocket frequently. I prefer a blackened clip as it is more discrete. I don’t like lots of branding on my clips. I personally prefer tip up carry. More importantly, I like a knife that is slim, lightweight, and not bulky. This goes back to the “Size” section. It is important for me to have an EDC knife that I can carry without annoyance. Ultra big and bulky knives don’t make the cut for me. I know some guys who love them, but I’d rather have a small manageable knife that stays in my pocket, than a big knife that lives on my shelf. Often this is referred to as the “deployment” mechanism of a folding knife, but it’s the way you get the blade open. These days you see a lot of flippers, thumb studs, and thumb holes. These are all great ways to get the blade open with one hand. Many knives can be flicked open quickly and easily. I like all 3 of those opening mechanisms. I’ll spend a little time talking about each one. Flippers are fun, and over the past few years have really picked up steam in the knife community. Knife enthusiasts have become connoisseurs of flippers. Kizer and Zero Tolerance make some of the consistently best higher end ($150-$300) titanium framelock flippers, and you can spend close to $1000 on a Shirogorov, but you don’t need to spend that kind of money to get a good flipper. CRKT makes some excellent budget flippers. The Swindle is an example of this. For $30 or so you get a bearing equipped flipper that flips with the best of them. These became very popular in production knives in the early 2000s. One of the best is the Benchmade Griptilian. It’s still one of my favorite thumb stud equipped knives, with the easy to access thumb stud and glassy action. Benchmade in general makes some great knives with thumb studs. A couple good budget options include the Zancudo and Rat II. Cold Steel makes a lot of great thumb stud folders as well, although many of their designs are on the large side for urban EDC. No discussion on opening mechanisms would be complete without a talk about thumb holes. Of course Spyderco was the company to put this opening mechanism on the map, inventing it in the late 80s. It’s an ingenious “less is more” design, and is an excellent way to get a blade open. Thumb holes are also great if you are going to be wearing gloves. Very practical and they can be fun to use. These are just some basic considerations for finding the best EDC knife. Did I leave something out? Feel free to tell me about it in the comments section below. Have you taken a look at the benchmade mini pika now that they updated it again and shifted it to the HD line? Incredible fit and finish on mine. Price was right too. I like it better than the older red class edition. Hey Sarge! I have not had a chance to check out the new Mini Pika, although I have heard about it here and there. I will have to check one out. I’m always interested in exploring new high value edc options so I’ll have to make some time for this one. Thanks for the great suggestion. It has the same scales, axis lock, etc. of the Griptilian but it has a very nice stonewashed s30v blade that has a blade shape that is similar to a sebenza. If you haven’t reviewed it yet you definitely should check it out. Thank you, I’ve feel like this knife doesn’t get the attention it deserves. Everybody who I know who has ever bought one has absolutely loved it! The Spyderco Para Military 2, Buck Vantage Pro, and the Benchmade Ritter RSK MK1. My pleasure Peter! I have only heard good things about it, and I’m a huge Griptilian fan to begin with – so naturally I’m all about an upgraded blade shape with S30V. I’m sure it’s an awesome knife. Can’t promise that the review will go up tomorrow but it is officially on the list. Thanks again for the great suggestion. Thank you Hieu! My pleasure entirely, glad you have been enjoying the website. After looking over your recommendations I respect your opinions. It seems you really keep in mind function,construction, affordability and looks of course. I will be buying a benchmade griptilian, spyderco delica 4, and one that is not on the list a tops fixed blade of some sorts. Thank you for a practical perspective on knives for the working collector. As appealing as autos and assisted knives are I am always scared of malfunctions. I guess I should get over my fear but, manual folders are almost just as quick with less problems. If you stumble on one that is great in 100-150 range let me know. Until then i’m sticking to fixed or manuals. Thanks man. I do take the recommended knives section seriously as I want to provide some honest people that may not know a ton about knives, but want to make a sound purchase. Also, I tend to agree with you on manuals vs assisted and auto knives, I think with the great number of awesome manual folders out there it’s entirely possible to get by without assisted openers (or autos for that matter). That said, assisted openers can be fun and if you go with something like a Kershaw, (ZT), or Benchmade assisted opener it should be extremely reliable. If you want a suggestion for a nice assisted opener in the $100 range the Zero Tolerance 0350 comes to mind – that is a really solid knife. What you said was Very Well put, I would like to add that I too enjoy the Assisted Opening Blades but I also can see the accessory of the Assisted Openers being a Hindering Factor where a lot of mud and blood is involved, where your manual opening knives would have such issues, a quick rinse in a Stream of under a water fall would clear any gum ups without the need of disassembly, Providing of Course one had the time and proper tools to do the job . Oh yes one last thing while I have a pretty good Collections of knives (Old and New) I have to Admit that I primarily carry a 28yr. Old SOG Sidewinder 1 that has NEVER Failed throughout all these years, it is Really a Pity SOG Discontinued this Blade. Hi Ricardo! I like the Ka-Bar Dozier folder as well – great choice! I EDC The Para2 in s30v DLC black on black. And the Benchmade 550 Griptilian in 154cm, have everyday for 5 months now. What a spectacular duo! I am pleased to see that these knives made your list, they are well worth the $ for what they give in return. I use them both daily in my career as a Auto Tech, mostly the Benchmade because of it’s serrated blade, but the Spyderco gets a fair amount of use also and its perfect foraelf defense. Love the website, I am a new subscriber, and will be reading often. Thanks for stopping by and commenting, Robert. Both the Para 2 and the 550 are modern classics and made their way onto the list for very good reason. Keep on enjoying yours – cheers! Hmmmmmmm……. Why do I not see any opinel knives listed? Opinel #6,7,and 8 are all excellent edc knives! There is a simple answer for that – I haven’t reviewed any! Not yet at least. I have owned a #8 for a while and plan on reviewing it eventually. But you are right, they are great EDC knives. Great read! Thanks for the article. I have 3 follow up questions: (1) what is the overall best edc self-defense tactical folding knife (assuming price is not a factor); (2) would you recommend carrying an assisted opening knife; and (3) if so, what is the best assisted opening knife for edc self-defense centered (assuming price is not a factor). Thanks in advance for your response! My pleasure! Thanks for checking it out. Great questions. (1) – This is so tough to answer. I do not have any kind of martial arts background which makes it really hard to comment on the efficacy of these blades on a self defense basis. Everyone is different in their styles, needs, etc. A good place to look at some of my favorite tactical folding knives is at my Recommend Tactical Knives page. That said, I like the Benchmade Barrage, the Benchmade 940, and the Spyderco Paramilitary 2 a lot. (2) – This is really based on your individual tastes, preferences, and needs. I personally am not a huge fan of assisted openers, but I do see the value, especially for people who may need to reply in their knives in a defensive / high stress scenario (eg, law enforcement, military). (3) – Once again the Benchmade Barrage is a great assisted opener. Slim, no-nonsense design paired with high end materials and exceptional fit and finish. Thanks again for the great questions. Hope this helps. The Barrage is an excellent option. I reviewed the full size version a few years ago (the fancy one with bolsters), but should really pick up a mini for review as well. Hi thanks for the great info. Would you consider reviewing the Benchmade North Fork? Thanks a lot. Thanks for the suggestion – I haven’t reviewed a Benchmade in a while so maybe it’s a good one to pick up for review. good list but too many spydercos, they all seem the same, and no kershaw skyline or knockout? Good point, Jerm. Both should be added to the list. I just found your site and am interested in your opinions and takes on EDC, especially for women and self-defense as well as practical use. So far I’ acquired two new knives. First is the Kershaw ” Leek”, which I love for a number of reasons. The balance is perfect, very sharp, small and easy open. Next is a tiny (2-inch folded) Gerber that I like very much. In addition I have two fixed-blades in the original ” Buck” knife 60’s version, and a nice Columbia. Am now considering another ” Onion” folder, but am a bit confused by the pros and cons of the 3 I’ve been looking at; chive, shallot, and the third in the same group, whose name escapes me at the moment. My question is whether you have suggestions for self defense that might me faster, less clunky, lighter- but still with a good sturdy blade….and I’d really prefer a US made knife if possible. Any thoughts, suggestions would be greatly appreciated. I’d really like to avoid the ” gimmicky” if possible ( neck-knives come to mind)! Thank you for stopping by. I really don’t have much in the way of self defense suggestions, since I have no training of any kind in using knives defensively (or any kind of self defense training for that matter). 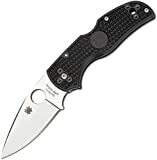 Of the list perhaps a Spyderco Native or one of the USA Made Ken Onion designs would suit your purposes. If I recall correctly the difference between chive, shallot, etc is mostly size. Of course the Kershaw Skyline is a classic USA made EDC as well. Hopefully this at least points you in the right direction. Thanks for your input. I’m not very familiar with the Spyderco’s, but I’ll check on them. Ken Onion designs–yes indeed, but the Kershaw you mentioned is new to me. This likely just requires more research than I’ve been able to give it so far. Meanwhile I really do appreciate your time and the suggestions, so I’ll keep looking. I love my CRKT Pazoda 2. It may be the most perfectly designed object I own. Compact, lightweight, rugged, one hand open+close, frame lock, flow through design so it’s easy to clean, holds a decent edge, and crazy inexpensive, around $10-$12. Thanks for stopping by and leaving some thoughts on your Pazoda 2. I have not checked that one out yet. Thanks for sharing. The DPx HEST/F Urban looks like a very nice EDC. It is being produced shortly and every aspect is USA made. I signed up on the Kickstarter website for a January delivery I hope. I like the SS roller bearings and size most. It is in limited supply for the first run but production on a larger scale with different handle materials is next so I am told. Here is the website if it is ok to post. If not, please remove the link. The HEST/F Urban definitely looks interesting. I’ll definitely be keeping my eye on it. Thanks for stopping by and for the comment. I got into collecting knives again a couple years ago. I live in the inner city and only carry a small knife (delica, crkt drifter, cold steel tuff lite, spyderco cat). I would NEVER use a knife for self defense. I’ve seen the aftermath of several stabbings and it’s not pretty (intestines hanging out). I wouldn’t want to have to explain myself in court no matter what the circumstances were. Bad idea. Maybe against an animal but never a human. I own the Zero Tolerance 562 (G10, Elmax). Excellent knife but really more to just show off. I’m not big on flippers and heavy knives with a thick blade. It’s the only ZT that has interested me. I also own a few (don’t know why a few) Spyderco PM 2s. Excellent knives. Also, a couple Griptilians and Colf Steel Tuff Lite. I think the BM 950 Rift is really underated. Awesome knife. I can understand not everyone liking the steel (154CM), handle, lack of any jimping. I have X-large hands and it fits me great. I don’t need any jimping on the knife. A couple budget knives I own are the CRKT Drifter (I like the heft and framelock of SS model). And the Kershaw Injection. Like the BM Rift, it has no jimping but very comfortable handle. Unlike you, I love the Spyderco Delica. The Endura is a horrible fit for my large hands. The handle is much too thin and any ergos are in the wrong place. The Delica really feels like a solid, quality knife. The Endura feels like a long blade slapped onto a piece of FRN. I don’t own any assisted openers except a SOG Trident. It’s OK at best. Killed me dropping $200 for the ZT 562. I would love to own a CRS or Stryder SNG but wouldn’t want to part with that much money. Anyway, great job on list and website. I refer to it often. Thank you very much for stopping by and taking the time out to comment. It sounds like you have handled some cool knives, and have a nice little collection going. CRK and Strider are both expensive brands, and at $300+ a knife, they certainly aren’t for everyone. You should definitely try to check them out in person if you haven’t though, both companies make beautiful knives. That said, brands like ZT, Spyderco and the high end Chinese manufacturers are all trying to close the gap and bite into this tier of premium knives. For what it is worth, I have no desire to stab anyone, I and don’t carry a knife for self defense. However, if it’s all I had and meant the difference between life and death I would do whatever I needed to do to defend myself. That said, I have never been involved or witnessed a knife fight, so keep that in mind. I appreciate the kind words and your patronage of the website. Thanks again. I just wanted to quickly explain myself regarding a knife for self-defense. I apologize and in no way was I directing the comment to you or anyone else. From reading this, I obviously know you are a smart guy and woukd do the right thing. It was my general opinion. try and disarm them first. And then beat the hell out of them. When I walk at night, I’ll take Mace (legal everywhere). And an asp. A telescoping steel rod that extends out about 2 feet. Much better options. I understand using a knife in a last ditch effort. Sorry for confusion. It would just be my last last last thing to use. Again, I refer to this website often. It has saved me time and money. I will support it anyway I can. About Self-defense, it is not smart to using a knife most of the times and as Thomas mentioned, it is much, much better using any kind of Sticks, Batons or even any kind of Knuckles. If you are using a knife in these situations, most of the time the result of the damage you may deliver to the attacker, coming too late and in that time you may have been overwhelmed and wounded as well. (Of course if you are not a martial art/Pro fighter.). But using some sticks or some thing pointy, kind a one finger knuckle, kubaton, any kind of Tactical Pens will do enough harm without the need of giving you rough days at court! However, Thomas I am not recommending you to try to disarm any attacker with a knife. It is always risky to get too close to him. As a knife dealer at the time of the First Gulf War, I was contacted by a special Marine unit with a hurry up order for Spyderco Enduras. Being unfamiliar with the new brand (and the knife was selling for under $20!, ) I researched the literature and said that they would break in the uses that they were doing (puncturing cans, digging in the dirt and other abuses). The response was interesting. They knew the limitations, but the product was so useful and relatively inexpensive that they would just buy more when needed. The approach/attitude that the Marines expressed helped change my thinking. The choice of a Spyderco Paramilitary 2 as an EDC is excellent. It is a “better knife” than the Endura 4. However, I won’t be as upset when my Endura is damaged or destroyed. And, yes, I have had items stolen in the past as well. I will experience less hesitation in using my Endura than the Paramilitary for daily chores as well. That is a great point, and is a big why I still review (and enjoy) budget knives. I love being able to use something like that guilt free. I can’t bring myself to seriously use some of the more expensive knives in my collection. Weight. This is of course related to size, but distinct. The lighter, the better. Carbon fiber and skeletonized handles really do make a big difference if you’re carrying the knife in a front pocket. Thickness. This is distinguished from size or weight. A slimmer knife is a lot more comfortable to carry, but at some point there’s a trade-off between portability and handling ergonomics. I like a knife that’s nearly flat. Opening mechanism. For EDC, I far prefer an assisted-opening blade. Your preferences may vary, but the ability to be easily opened with one hand is a necessity for me. Thumbstud. If you clip the knife in your front pocket, you don’t want this, because it scratches your fingers every time you reach into the pocket. Grip surface. Smooth is too just slippery for me. Carbon fiber with some texture is ideal. Serration/scalloping. I prefer serration for most EDC cutting tasks, but some prefer non-serrated blades, especially for opening bubble plastic packaging. If you’re breaking down a lot of cardboard boxes, you will be amazed at how much easier the scalloped blades cut them. Pocket clip design. If you prefer a clip, you really need to know what kind of material you’ll be clipping it onto, because no clips work well with all materials. A broad, flexible clip works great for denim pockets, but will be too loose for suit pants or shirt pockets. A longer, slimmer, firmer clip works best for thin materials. I usually carry my EDC in the “fifth pocket” in the right from pocket of my denim jeans, so I remove the clip altogether. My preferences: 1. Buck Apex with clip removed, in my front denim #5 pocket. 2. Kershaw Zing when I wear a suit, clipped in my front pocket. What do you know about the REATE EVENT HORIZON? It is currently on sale for a great price, but I can’t find much info review wise…thanks! Mike, Reate makes excellent stuff. I need to review some of it (actually, I have a Todd Begg Steelcraft Bodega on deck made by Reate – it’s beautiful). I say buy it if you like the look of it and the price. Have your feelings about some of the Hinderer models changed now that the prices are more in line with production or mid-tech knives? One can get into some of the Hinderers for the same price or less than the CRK knives that you listed. Rye, They are excellent knives, and the little 3″ version is a great size for urban EDC. I’d put it up there with the CRK products, and I highly recommend it if you like the idea of the knife. I think the 3.5″ and XM-24 are too large for most people to EDC. I really have never been good with a thumbstud, and as I weaken (myasthgenia gravis, and age) I more and more prefer assisted opening with a flipper. I like your definition of edc, although I feel there should be a new classification. EDU, everyday use. It’s one thing for a knife to look pretty in your pocket or hand and easy to hold an edge if you pull it out to show someone how sharp it is. But how it handles true everyday abuse is what really counts. I have owned my share of the higher end knives as well as lower end. My true edu for the last 4 or 5 years has been a Kershaw junkyard dog composite. I work in a warehouse where I cut boxes and tape all day long which is brutal on an edge, but I do a lot of work around the house and work on cars so it also gets used for things it shouldn’t. I have used it for cutting wires, as a screwdriver, a pry bar and even as a hammer, and to this day it still performs. It flips open easy, the lock still engages solidly and there is no chipping of the blade or handle. I received a ravencrest ambassador two months ago and have cut boxes everyday with the factory edge so it might become my backup taking the place of my Mantis MK-2. The point of this is don’t shy from the low price point knives because they don’t cost as much. My Kershaw was only 65 new and it has far surpassed my Benchmades or Emerson knives. Look for how easy it opens and closes one handed, how solid does it lock, and how long the edge lasts, not how well it shaves.